The Royal Palace is an enormous palace, one of the biggest in Europe, with scorching plains of concrete around it. Though it is the official residence of the King of Spain, the royal family does not actually reside here and it is generally used only for state ceremonies. 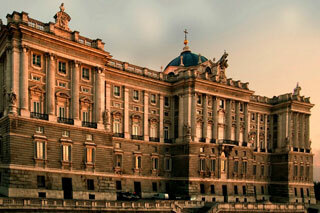 The Royal Palace is considered to be one of the most emblematic and beautiful buildings in Madrid, not only for its location on a bluff overlooking the river valley but also for its architecture and the artistic treasures to be found in its rooms. This article uses material from the Wikipedia article "Royal Palace of Madrid", which is released under the Creative Commons Attribution-Share-Alike 3.0 License.